Andrea Bishop from The Electric Quilt Company talks with Quilting Arts host, Pokey Bolton, about “Flower Power” and designing your own wreathed flowers to use as applique or quilting stencils in Electric Quilt software. For this segment in Episode 106 of Quilting Arts, Andrea Bishop shows host Patricia Bolton how easy it is to import a photo and trace it to make custom appliqué patterns for quilts, pillows, and purses. Andrea Bishop shows host, Pokey Bolton, how to setup scenes with different furniture in Electric Quilt 6 using Angie Padilla’s “My Dream House” add-on to make pillows and quilts. The pieces are then appliquéd or printed in color onto EQ Printable Inkjet Fabric. An option for a “flat” dollhouse is also presented. 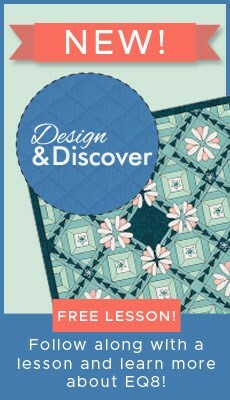 Andrea Bishop and host Patricia Bolton look at how EasyDraw™ in Electric Quilt 6 software is great for making pieced patterns. Drawing random lines and curves in a block makes a quick pattern you can follow for an abstract quilt. This was Andrea’s first attempt ever at sewing curved piecing and it went together really fast using EQ6′s templates! In this episode Andrea Bishop shows host Patricia Bolton her ideas for mixing techniques using EQ Printables Inkjet Fabric and EQ Printables Foundation Sheets. By printing on the fabric, you can sew pictures of artwork or family into quilts. By printing on the foundation sheets, you can create translucent fabric overlays as embellishment. In this episode Andrea Bishop shows host Patricia Bolton her ideas for Journal Quilting. It is easy it is to do Journal Quilting if youre printing on fabric. Not only will you be quilting, but you will be creating a scrapbook-like photo album at the same time. Its time to get those photos off your digital camera and onto fabric!